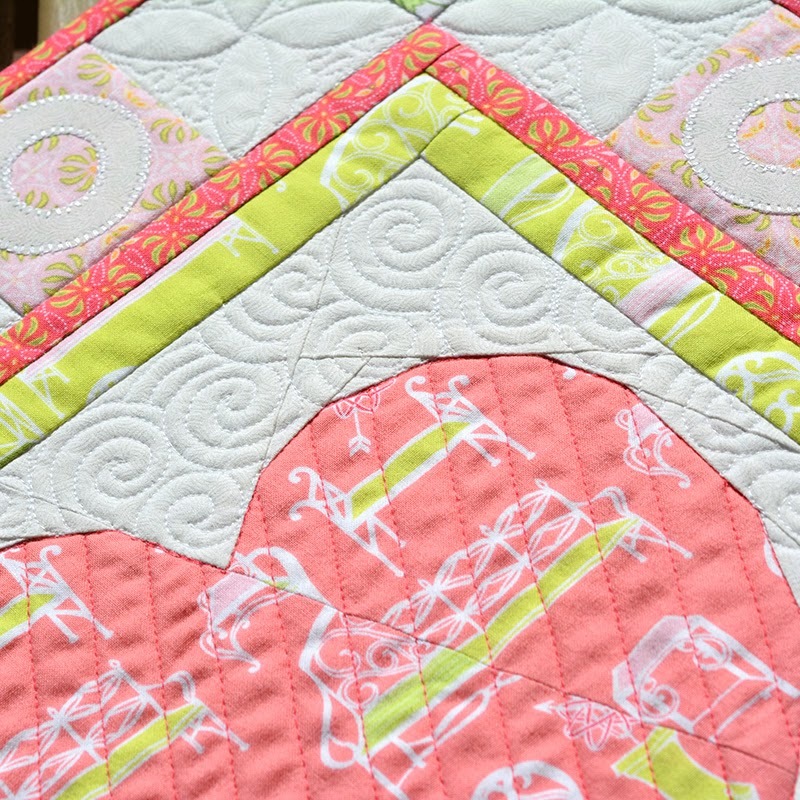 Today is my day to post my project for the Hugs and Kisses Blog Hop going on at Sew We Quilt. 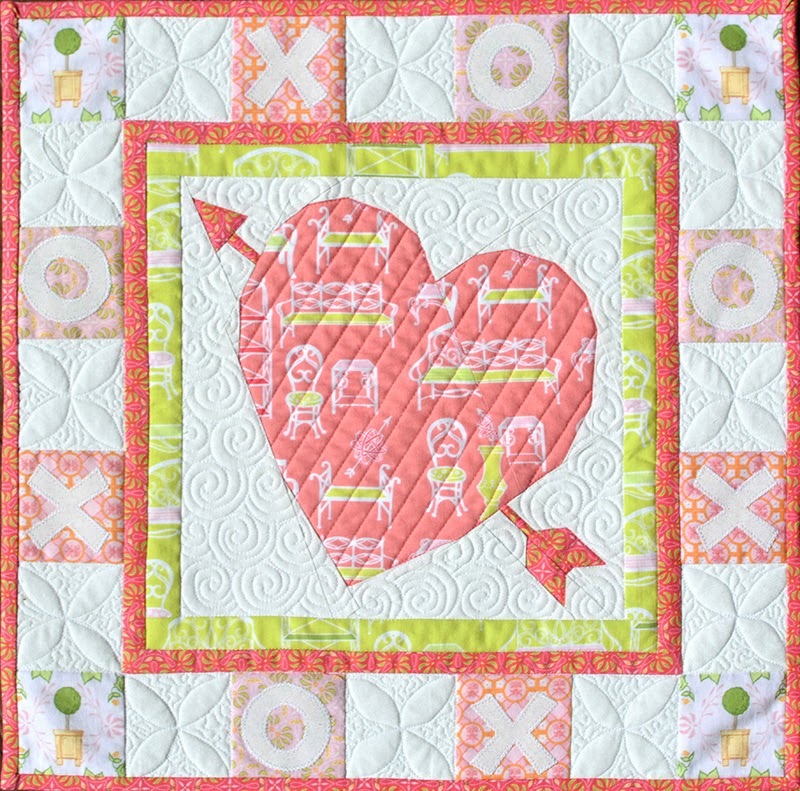 We were asked to sew 1, 2, or 3 Valentine’s-themed paper-pieced blocks designed by Soma from Whims and Fancies. Proceeds for these patterns go to charity and you can find out more about where to get them at Sew We Quilt. And now for the giveaway! 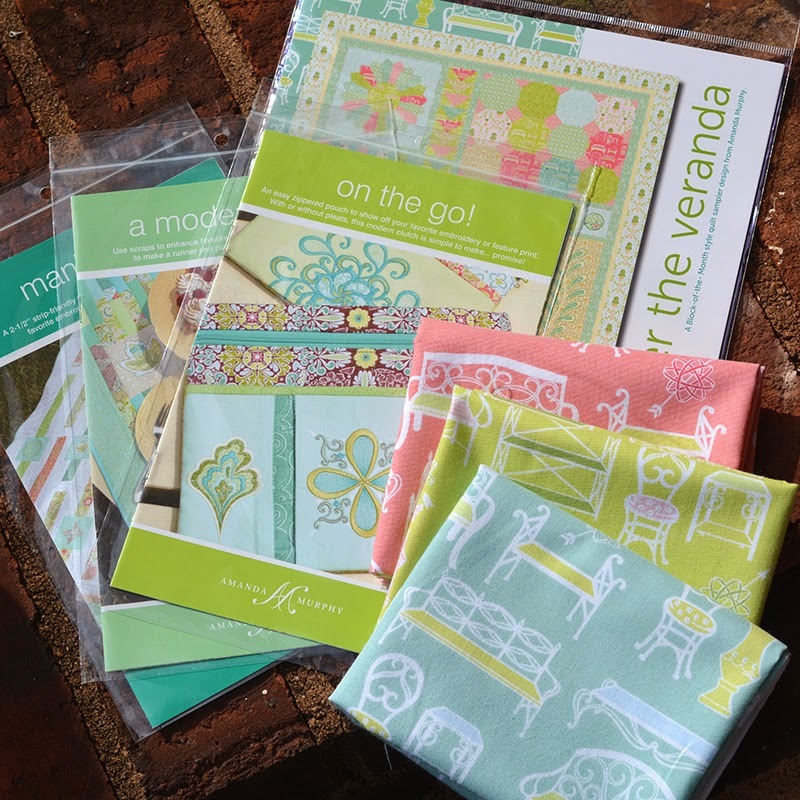 I’ll be giving away a copy of my block-of-the-month Under the Veranda, (which is pictured in Topiary on the cover), three patterns from my line, and a fat quarter of the “Gazebo” fabric in all three colors. To enter, hop on over to the Topiary page at Blend Fabrics and leave a comment below telling me what is your favorite Topiary print. One comment per person please and let me know how to reach you if you are an anonymous. For an additional chance to win go follow me on Instagram (AMANDAMURPHYDESIGN) and mark my picture of this project over there as a “favorite”. So there will be an Instagram winner and a blog winner, okay? Deadline is today, Tuesday the 18th, at midnight. Love the FABRIC you chose…and such good work stitching !!!!!! Beautiful quilt, so light, and the quilting….. I really love your heart quilt…it is so beautiful!! I really like the X and O blocks in the boarder. My favorite is the Gazebo pattern in pink. Thank you for sharing! Everbloom Green is my favorite – thanks. This is just gorgeous with those fabrics and your quilting…love it! Everbloom Green is quite lovely. Thanks for sharing your beautiful creation! I love your heart quilt…. great job! The fabric line is beautiful, but I think I'd choose the green to represent the coming of spring. Thanks so much! SEW lovely! =) They're all beautiful, but Orchard Pink is soooo appealing…ready for spring. 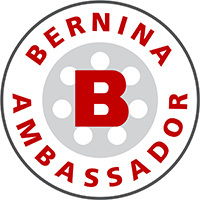 =) Thank you for a chance to win. 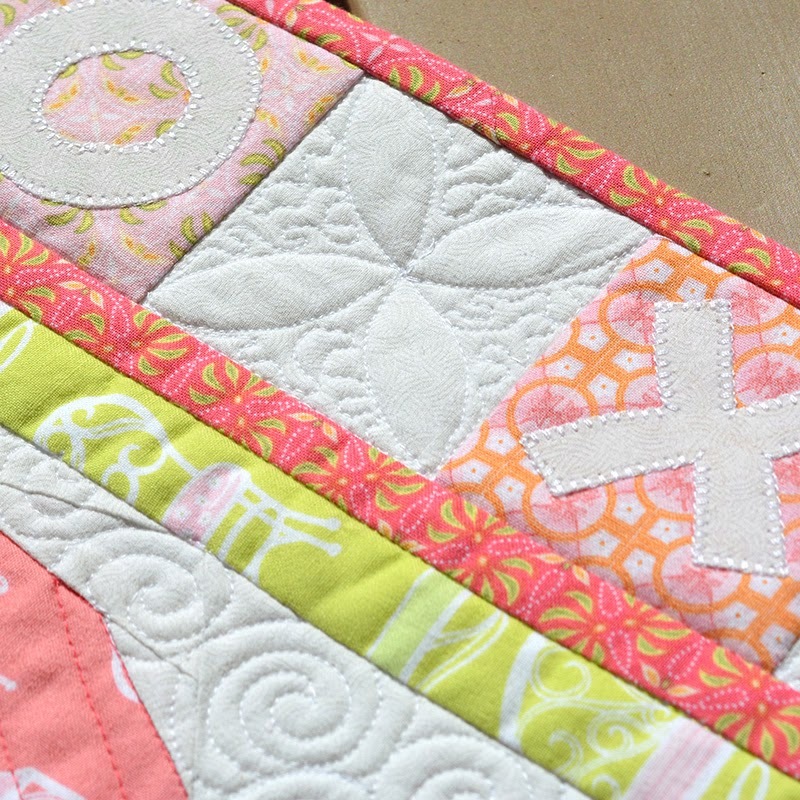 Very pretty…love the touch of applique, and with the quilting you did, it really brings it all together. 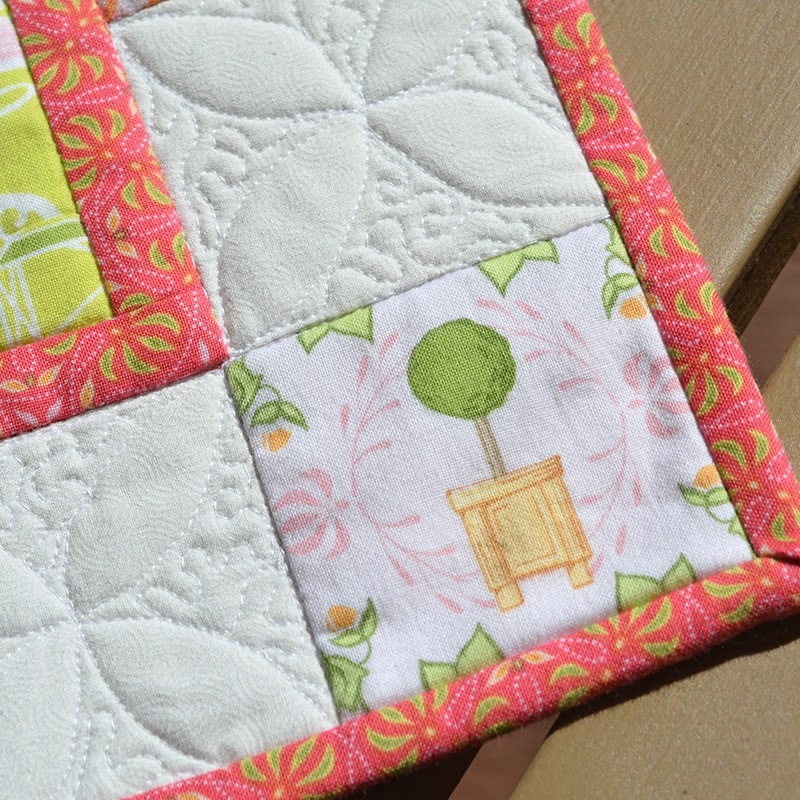 This quilt really shows off the topiary fabric nicely too. Love it! Everbloom–all three colors is my favorite. Oh what a gorgeous mini! I love Gazebo in Blue – these fabrics are so fresh and happy! Your little quilt is really stunning. I love everything about it … the design, the fabric and the quilting. My favorite print in your Topiary line is Everbloom Green. Amanda … that is a tough choice!! I will have to choose Arbor Walk Light Blue only because you're making me choose but then I'd add the Orchard Blue as a close second, and if I purchased those two, I'd want a bit of each in your collection 🙂 … Beautiful work as always!! 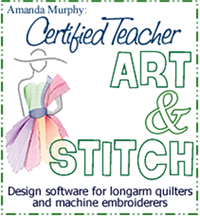 Thank you so much for this chance at your wonderful patterns!! Oh wow! Your wallhanging is beautiful – wonderful fabric, great design, beautiful quilting! 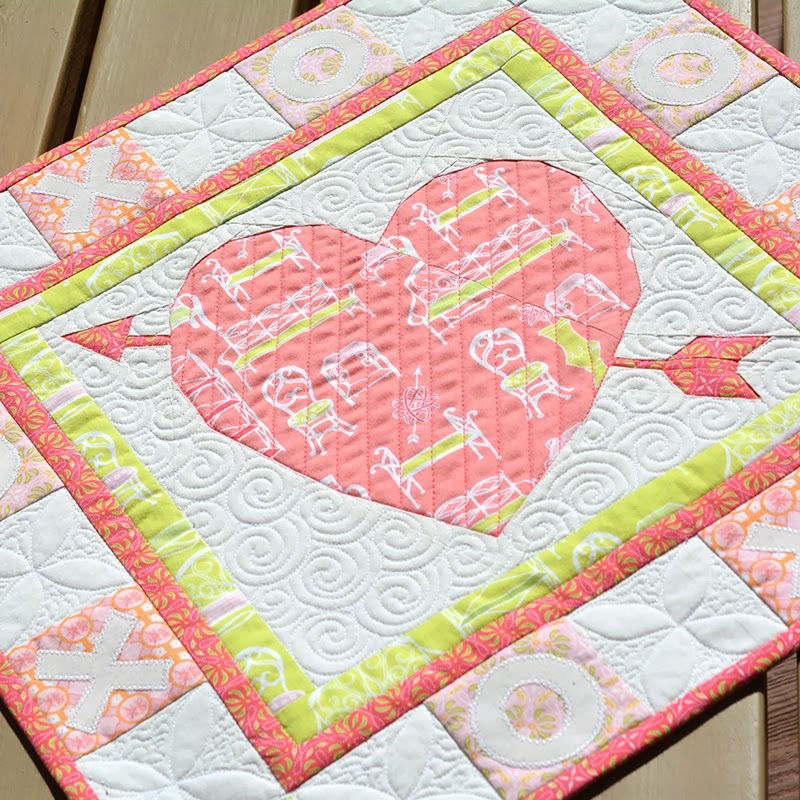 It's refreshing to see a Valentine themed quilt in these soft colors. I love the Everbloom green print. It's so delightfully springy! Thanks so much for sharing! Actually they are gorgeous, but love the Garden Pink is my favorite! Lovely giveaway…thanks!